The Force partnered with two community non-profits to give back to local youth, Girls on the Run Chicago and Leaning Tower YMCA. On Saturday April 26th the Force participated in Healthy Kids Day at the Leaning Tower YMCA located in Niles, IL. The Force led a flag football clinic for young girls and boys. Force players led youth through basic football instruction, interactive drills and the day culminated in a scrimmage. Youth ranged from 5 year olds to 13 year olds, most of which had never played before. At the end of the clinic all participants and families were invited to attend that evening's home game against the West Michigan Mayhem. Thank you Leaning Tower YMCA for allowing us to contribute to Healthy Kids Day! 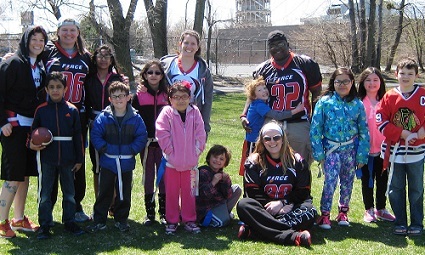 With a bye-week on Saturday May 10th, the Force were back out in the community. 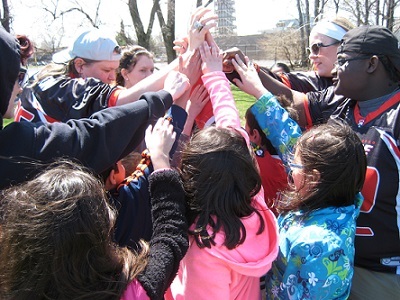 Players joined Girls on the Run, a national non-profit organization committed to encouraging girls to be healthy and confident through health education, socio-emotional learning and training for a 5k race. 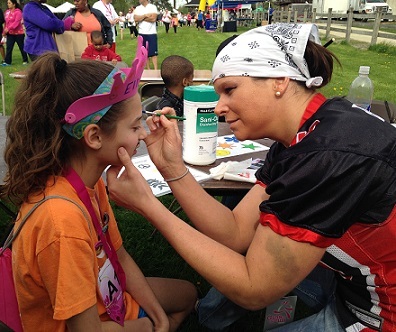 Girls on the Run hosted one of it's three regional 5k races at St. James Farm in Warrenville, IL. Force players were thrilled to join the celebrations and helped with post-race activities. Players helped to paint faces and apply color streaks to hair. These women's talents are vast! Thank you to Girls on the Run for a great event! Congratulations to all participants that completed the race- most of which it was their first!